Established in the 1925 as a manufacturer of accordions, Hagstrom also has a long history of building guitars. Production of acoustic steel string and classical guitars dates back as early as the 1940‘s. In 1958, the first Hagstrom electric guitars were built. Covered in sparkle and pearloid celluloid with stamped metal logos, they featured an ingenious use of materials previously used in their accordion production. Over time Hagstrom’s range of instruments expanded into classic designs such as semi-acoustic and jazz models (“Viking®” and “Jimmy”), solid-bodies (“Swede” and “Super Swede”), and electric basses. The world’s first 8-string bass, the “H8”, was introduced, and became an instant success. 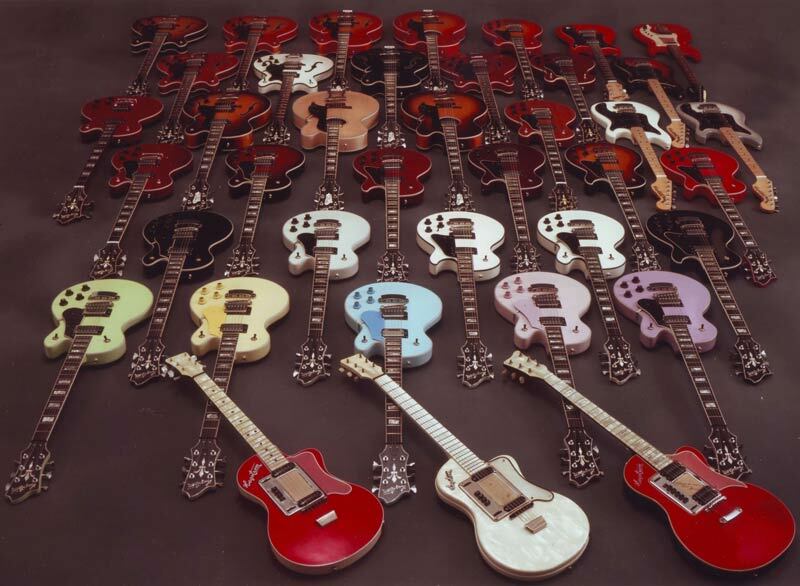 Hagstrom guitars became known world-wide for their professional quality, excellent playability, unique features, and great value. We have gone to great lengths to re-create the modern Hagstrom range using original designs and production techniques. Our manufacturing team searches the world to find the best raw materials and hardware, and then supplies our manufacturing partners with the detailed specifications and guidance necessary to authentically re-create Hagstrom’s classic models. Hagstrom’s unique H-Expander™ truss-rod, bridge and tailpiece designs, and other cosmetic features such as logos and headstock designs are all authentically re-created, and based on original specifications and drawings. Our pickups are custom-wound and carefully based upon original designs and voicings. Hagstrom’s tradition of innovation continues with careful introduction of more modern features and design enhancements, without compromise to our traditions. For example, fingerboards are now made of our unique Resinator™ wood, with resonance and sustain qualities far superior to anything ebony or rosewood can offer. Original tuning key designs have been slightly updated to make them easier to use, and electronics controls have been enhanced where appropriate to appeal to modern playing techniques. We’ve also expanded the range by introducing the Ultralux and Northen Series to meet the needs of modern players. Every step of the way we have strived to deliver the same exceptional performance at surprising value, which is the historical foundation of Hagstrom’s reputation. The minute you lay your hands on a Hagstrom and strum it for the first time, you can instantly feel why Hagstrom has legions of devoted fans and why so many pro musicians have made it their “number one”. Hagstrom’s unmistakable headstock is iconic. Hagstrom guitars are also known for their playing comfort and tonal versatility, the result of design innovations such as our aerospace engineered H-Expander™ truss rod, Resinator™ fingerboard, custom wound pickups, and unique hardware. All of these features contribute to Hagstrom’s distinct and unmatched sound, which has jumpstarted many careers around the world. Now fasten your seatbelts and let us take you on a ride to explore the Hagstrom range. You’re about to discover a dazzling assortment of electric guitars, electric basses and acoustics that will whet your appetite to travel to your nearest dealer and try one out today. Enjoy!